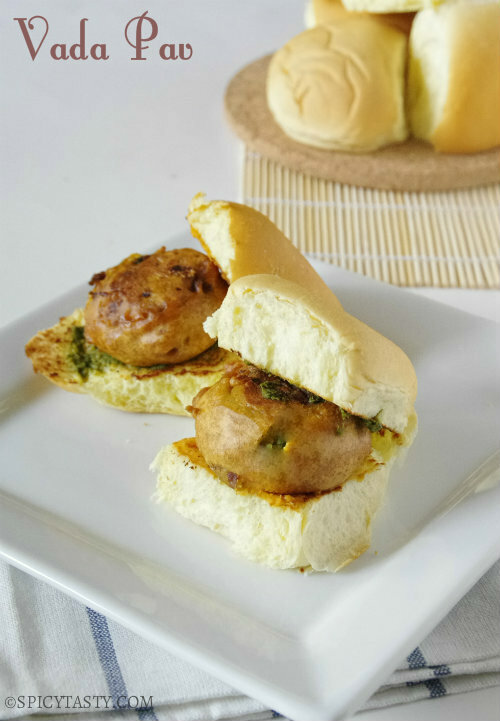 Vada Pav is a popular Indian burger and one of the most favorite street foods in Maharashtra, particularly in Mumbai. It is priced fairly cheap which makes it a go to snack for everyone. 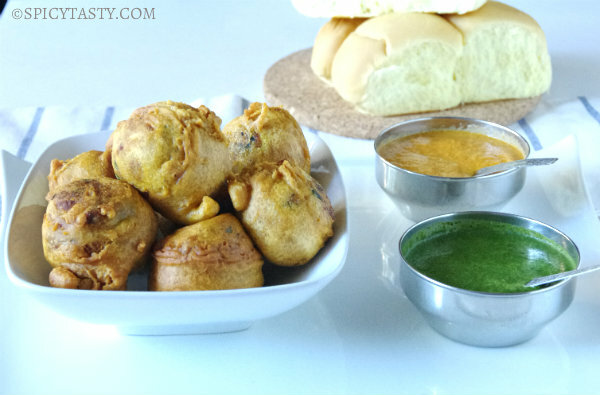 Spicy potato balls known as “Vada” are deep fried in oil and served with toasted buns also known as “Pav” smeared with red garlic and green chutney. It has a perfect balance of spicy, tangy, crispy flavors which makes you enjoy each and every bite. Though it is a guilty pleasure, it’s okay to indulge in your favorite snack once in a while. I enjoy my Vada Pav with a little bit of garlic chutney and lots of green chutney. This will make a perfect snack for parties, picnics, game night, etc. For parties, you can make the potato vadas ahead and heat it in oven or griddle just before serving. For picnics, you can pack the sandwich individually and serve. Boil or pressure cook potatoes. Peel the skin and mash them. Heat a tbsp of oil in a pan and add mustard seeds. When it pops add cumin seeds. Then add coarsely ground ginger, garlic and green chilies. Saute for a couple of minutes over low heat and add onions. Saute until it becomes translucent. Turn off the stove and transfer it to a bowl along with mashed potatoes. Add garam masala, salt and finely chopped cilantro. Mix well. Make big balls and keep it aside. Mix all the ingredients for batter in a bowl and add water little at a time and make a thick batter. Leave it for 5 minutes. Heat oil for frying. Dip the potato balls in the batter and fry it in oil over medium heat, turning both the sides until it becomes golden brown. Preparation of Red Garlic Chutney: Grind all the ingredients under “red garlic chutney” with a little bit of water to a chutney consistency. Adjust chili powder to taste. Heat a tawa or pan, butter it and toast the buns. Spread the green chutney on one side and the red chutney on the other side. 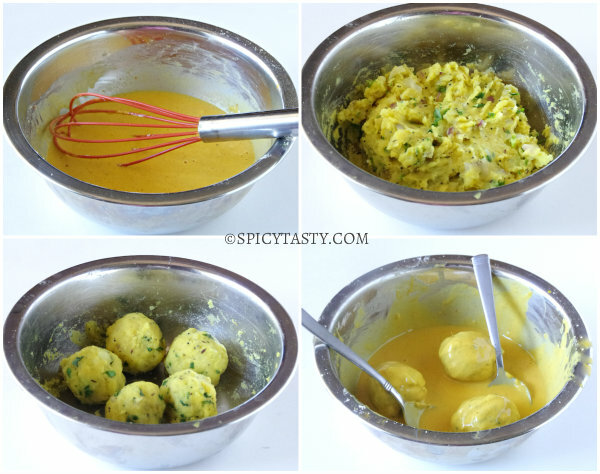 Place the vada or fried potato balls in between and serve hot with more green chutney. 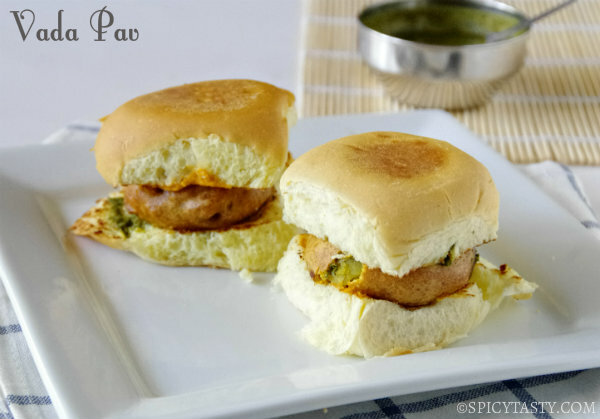 Dip the vada pav in green chutney for a tangy and juicy bite. A favorite indeed…wouldn’t be able to resist just one.